In its most simple form the cavesson is just a straight band around the horse’s nose attached by a sliphead to the bridle. Different widths can be used to good effect: a thin or a rolled nosepiece will suit a very fine delicate head, whereas a thick nosepiece on a long face can give the impression of a much shorter head. A thick band strategically placed can improve a nose with a bump in the wrong place. TO FIT: If fitted for only cosmetic effect, the band should lie two finger widths below the projecting cheekbone and you should be able to get two fingers between the band and the nose. Fitted a little lower and fastened tighter, the cavesson can discourage the horse from opening his mouth too wide to evade the action of the bit, in this case a thicker padded band should be used to distribute the pressure more evenly. This noseband has several different names and slight variations of style but the principle is the same. The band is well padded because it has to be tight to be effective so you must ensure that it fits the horse well. The strapping actually doubles back on itself enabling it to be tightened potentially very severely. When circumstances dictate that a flash or drop noseband cannot be used, for instance with a double bridle, this noseband hrmly fastened will help to dissuade the horse from opening his mouth to evade the action of the bit. TO FIT: It should be fitted like a cavesson noseband. The padding should almost meet when the noseband is done up to the required tightness, so that the thinner, non-padded tightening strap does not touch the horse. Extra padding can be put behind the noseband Where the pressure is greatest to prevent rubbing. The flash is really a cavesson with a detachable lower strap. The noseband was designed to allow a standing martingale to be fitted to the cavesson part if required, the lower strap can be fitted quite tightly to dissuade a horse from opening his mouth too wide. TO FIT: Although fitted just like a cavesson, it should be high enough to ensure that the lower strap does not interfere with the horse’s breathing. For the noseband to have any effect, both bands must be fastened quite tightly. If you are relying on a tight noseband every time you ride you must make sure that the horse is not getting rubs or calluses from the constant pressure. The lower strap should be done up on the side of the nose and not directly under the chin, this is much more comfortable for the horse. If fitted correctly the drop noseband closes the mouth more effectively than any other aid. As the horse opens his mouth to evade, a lot of nose pressure is created, this encourages the horse to drop his nose and relax his jaw to relieve the pressure. Care must be taken in the fitting of the drop; I have always had drop nosebands specially made. The ones usually available in tack shops are too long at the front of the nose and the buckle end of the back strap can often also be too long and the strap end too short, making it impossible to fit correctly. The best shop bought ones are of the fully adjustable style that can be altered either side of the nose. TO FIT: The drop should be fltted with the front of the band above the nostrils on the solid part of the nose and not on the soft, fleshy nasal cartilage, the back strap should angle down below the bit and do up between the chin groove and the corner of the mouth, to avoid any pinching. This is an effective aid for upper and lower jaw pressure working on a larger overall area than a lot of other nosebands but it is not accepted by all equestrian disciplines. There are several different patterns of Grakle: the only one that works as originally intended is the one that adjusts on the nose (the straps can be moved through the nosepiece and are not riveted into place). By moving the straps through the nosepiece you are able to alter the pressure of the noseband up and down the face. TO FIT: The top strap should be fitted high, pulled up by the sliphead of the noseband but not high enough to be able to rub the projecting cheekbone; the bottom strap should slant down to fit below the bit and fasten on the side of the horse’s nose, like the lower flash noseband strap, not under the chin where it may pinch. This noseband gives quite severe nose pressure. As the bit is pulled back in the mouth, some of the pressure is transferred to the nose by the noseband pulling across and down on the nose. This often works because the formative training of young horses relies solely on pressure on the nose. There are several patterns of Kineton on the market, one allows for extra adjustment on the nosepiece itself. The original Kineton pattern had a piece of metal set into the nosepiece for more severe pressure. The metal loops fit inside and under each side of the bit and attach to the nosepiece. This noseband should only be used with a snaffle bit. TO FIT: Fitted as a drop noseband, the nosepiece should lie on the nose bone not on the nostrils. The metal loops fit inside the bit rings and under the bit mouthpiece on either side of the bit. 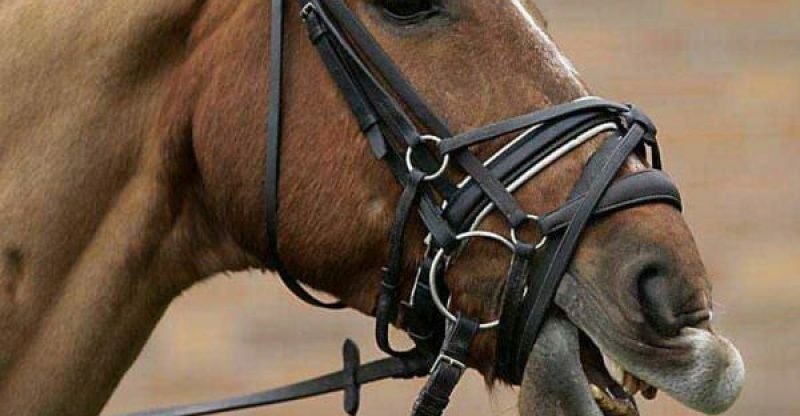 Below are two versions of the same principle: as the bit is used, the noseband is pulled back against the front of the horse’s nose and the horse feels encircling nose pressure as well as pressure from the bit both inside the mouth and in the chin groove, in the case of a bit with a curb chain. TO FIT: Both versions are normally secured to the middle of a cavesson noseband with a small strap, the Bucephalus noseband then lies on the horse’s face and the straps go below the bit crossing over under the chin and hook onto the curb hooks of the bit. A version with hooks can also be hooked to the floating rings on a Wilson snaffle or into the top eye of a pelham or curb bit. The Worcester has been specifically designed to allow the rider to apply varying degrees of nose pressure by using the reins. It is a wide, padded cavesson noseband with a crank-style fastening enabling the nosepiece to be fastened very firmly thus dissuading the horse from opening his mouth very wide to evade the action of the bit. On the front of the band is an additional nosepiece sewn in two sections that angle down and fasten onto the front of each side of the bit, these straps can be adjusted to enable more or less nose pressure to be brought to bear. It also seems to encourage the horse to drop the nose to a certain extent. TO FIT: The Worcester flts like a conventional cavesson noseband, the nosepiece lying on the horse’s face two finger widths below the projecting cheekbone but no lower as the drop section must obviously not interfere with the horse’s breathing. This is a very severe noseband which can be used on a strong horse to good effect by a very experienced rider. The action dissuades the horse from opening his mouth Wide and, in particular, from crossing the jaw. As the horse tries to open his mouth to resist, there is very considerable pressure from the crossed chains on the back of the jaw. The only way the horse can alleviate this pressure is by closing the jaw and dropping the nose. TO FIT: Although this noseband looks like a drop nosepiece at the front, it should be fitted above the bit with the two chains crossed at the back of the jaw and fastened snugly but not overly tight. This thickly padded nosepiece adjusts on the front of the nose and the shape is similar to an adjustable drop noseband. A chinpiece passes through two rings at the back of the nosepiece and at each end of the chinpiece are rings for the reins. This can be used as a bitless bridle or you can use a combination of bit and rein by attaching the Scawbrigg to a bradoon sliphead on a conventional bridle and then attaching the bit to the cheeks of the bridle. With a rein on the bit and a rein on the Scawbrigg the rider can apply bit and nose pressure in varying degrees. TO FIT: Using a conventional bridle, the Scawbrigg should be fitted high enough so that the nosepiece does not interfere with the horse’s breathing and adjusted so that it fits snugly against the face before the reins are taken up. When used with a bit the nosepiece should be attached to a bradoon sliphead and the bit should be attached to the cheekpieces of the bridle. Fitted in this way, both the noseband and the bit have separate reins and the rider uses a combination of nose and bit pressure to maintain control. The Gloster noseband can be used in five different ways to achieve very specific results. The noseband is a cavesson with a padded lower nosepiece incorporating a sprung steel core sewn into the nosepiece front. The lower piece has an encircling design with rings to which to attach a pair of reins. 1. For a horse who carries his head very high or has a tendency to rear, a standing martingale can be attached to the bottom nosepiece rings. As the horse raises his head or tries to rear, the nosepiece is tightened by the martingale and creates nose pressure, the pressure continues until the head comes back to the vertical an easier angle of control when the pressure is released immediately. 2. When riding reins are attached to the bit, draw reins can be attached to the lower rings applying nose pressure on the lower part of the nose. Skilful application will allow a rider to use the two sets of reins independently or to work the horse between them. 3. A neck strap can be attached to the lower nosepiece and fastened firmly around the upper neck about two hands breadth behind the ears. This helps to dissuade the horse from trying to lower his head to buck. If the head is lowered, pressure is brought to bear on the back of the upper neck and also on the lower nose, as soon as the head is raised the pressure is released. 4. If for some reason no bit is required, the headpiece of the noseband can be slipped off and the noseband can be fitted to a conventional bridle headstall, the reins then attach to the lower rings and you have a bitless bridle. 5. It can be used with two sets of reins so that one set of reins is attached to the bit and a second set is attached to the lower rings so that the horse can be worked between the two reins creating more or less nose pressure as required. TO FIT: The Gloster is fitted like a cavesson noseband well up on the face but not rubbing the projecting cheekbone. The lower nosepiece is adjusted to lie on the nose bone, not on the soft fleshy nostrils, so that it does not interfere with the horse’s breathing; it is fastened firmly below the bit but not overly tight. The supporting straps between the upper and lower bands should be adjusted to lie on the horse’s face in front of the bit. The rein rings hang below the lower nosepiece to have either reins, draw reins, martingale or neck strap attached to them. This noseband has a short front piece attached to a curved metal cheek and two straps at the back, one lying on the upper part of the jawbone and the other lying in the curb groove. The best pattern has an adjustable front. It has very definite jaw closing qualities. As the horse resists by trying to open the mouth or cross the jaw, great pressure is felt both in the curb groove and also on the more sensitive upper jaw area. As the horse lowers his head and closes his mouth, pressure ceases, thus dissuading the horse from trying to constantly open his mouth to evade the action of the bit. TO FIT: The front nosepiece should fit at the level of a drop noseband, on the nose above the nostrils, without interfering with the horse’s breathing. The upper back strap should be fastened so that you can just get one finger between the face and the band. The lower strap fastens below the bit and, again, you should be able to fit one finger’s width between the strap and the horse’s jaw. Why Use Training Aids At All?